What’s not to love about a free book? As you can see from the pic, if you buy certain Mother’s Day gifts from fabulous chocolatiers, Montezuma, you get a free copy of All That Mullarkey! This applies to both in-store and on-line purchases. 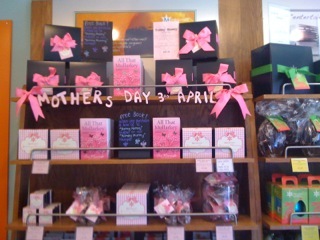 Or you can buy the yummy chocolate for your mummy – and keep All That Mullarkey for yourself. Or give it to your mum and then borrow it back. And, for anyone who’s wondering – UK Mother’s Day is 3rd April, this year! Love and Chocolate, my favorites! Fantastic marketing idea! Love it. I’ve read the book and it’s great – could still find an excuse to buy the chox, though.